On the one hand, the population of the European Region is projected to increase only slightly by 2020 – from 894 million to 910 million – but then to return to current levels by 2050. On the other hand, the number of working-age people is expected to decline steadily and the number of older people to increase, leading to an increase in the old-age dependency ratio. 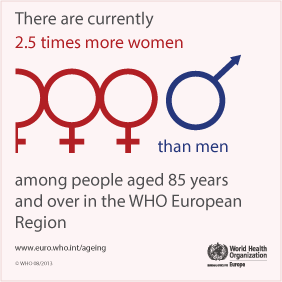 In particular, the proportion of people aged 65 and older is forecast to almost double between 2010 and 2050 and the number of people aged 85 years and older is projected to rise from 14 million to 19 million by 2020 and to 40 million by 2050.